French reforms spark angry scenes Jump to media player Protesters have taken to the streets in French cities to voice their anger about planned reforms to labour laws. Protests over French labour reforms Jump to media player The French government is facing a vote of no confidence in parliament after it forced through a controversial bill designed to reform Labour laws. 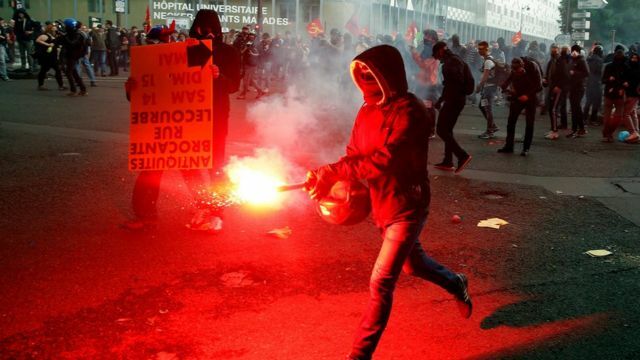 Labour law protests flare in Paris Jump to media player Clashes broke out in Paris between police officers and protesters against a proposed labour law change in France. Protesters have taken to the streets in French cities to voice their anger about planned reforms to labour laws. The government says the changes will help create jobs and bring down unemployment, but opponents fear they could weaken workers' rights. The opposition tried to block the plans in the national assembly but failed, as Ben Bland reports.